About a 15 to 20-minute drive from the hotel, the Jolly Pumpkin compound (yes, compound, encompassing a tasting room, brewery and distillery, restaurant and gift shop) faces the West Bay on the Old Mission side of the Peninsula. It’s a local favorite hangout, and when you visit, you’ll soon see why. This is of the nicest taprooms around, with a dark, rustic pub-like feel. It features a giant fireplace, cozy couches, high-top tables, booths or bar seating, with mugs hanging high above. We suggest starting out with a snack board – a whopping two feet of meat, cheese, bread, olives and pepperoncini. Next, the beer. Oh, the beer. A regular Jolly Pumpkin beer on tap, Bam Biere, is named for Bam, the brewery dog, who was – BAM! – hit by a car and kept on kickin’. The farmhouse ale is golden, naturally cloudy and dry hopped, brewed for anyone who’s been knocked down and gotten back up again. There’s also Bam Noire, dark and smooth with hints of coffee, on draft, as well as Oro de Calabaza, strong and peppery, and La Roja, an earthy red, by the bottle. These four standouts are accompanied by an ever-changing menu of seasonal brews, like the La Parcela pumpkin ale we sampled in the fall. The brewery also serves up Michigan-made North Peak drafts, home-distilled craft spirits and a selection of red and white wines by the glass or bottle. On our visit, it was a cold and rainy day, so we opted for warm, comfort food – enjoying the Bison Sloppy Joe and a Prosciutto Flatbread. The Jolly Pumpkin makes its own pizza dough fresh daily, using quality ingredients including handcrafted beer. It’s surprisingly light and definitely delicious. Don’t miss the house-made chips. It’s not adults only, either. The restaurant has a family-friendly vibe, with a nice selection of kid’s meals, too. From your table, you’ll overlook a courtyard, for beautiful vistas any time of year – albeit particularly spectacular when the foliage turns shades of red and gold in the fall. 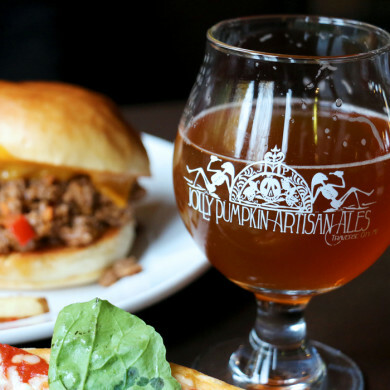 For excellent views, menus and brews, there’s no place like the Jolly Pumpkin. The Jolly Pumpkin Restaurant and Brewery is located at 13512 Peninsula Drive in Traverse City, MI. For more information, please call (231) 223-4333 or visit the Jolly Pumpkin website.